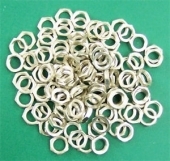 100 Pieces new 1/4""-32 Thin Nuts for Potentiometers etc. "300 #6 3/8"" Hex Head Slotted Steel Sheet Metal Screws HA"
FIVE CT12-FP-SS Triple gang stainless steel faceplate for six CT couplers. Sennheiser IZK 20 - Mounting Clamp for SI 20 or SI 30 IR Conferencing Modulator.